This scandalous 1993 'photo' of Susan Hammer was an early demonstration of the wonders of Photoshop. The mayor and her colleagues were infuriated by the 'vulgar' and 'sexist' April Fool's prank. 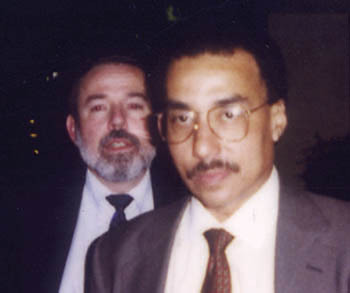 Eye paparazzied Merc execs Bob Ingle and Jay Harris after a secret 1994 dinner to introduce newly named publisher Harris to his new colleagues. Tony Ridder retaliated with a classic RF, but we didn't let him get away with it. The catalyst for Public Eye was a memo from one of Metro's shareholders, Rolling Stone magazine editor and publisher Jann Wenner, who recommended a "Random Notes"-style gossip column. Rather than focus on entertainment or celebrities, Metro editor Dan Pulcrano began writing an unbylined inside information column consisting of short items written in an irreverent style. Early columns included items about high-tech companies, bank mergers, the music industry and weird crime reports from local police blotters. As it evolved, Eye found its groove as an insider's bead on City Hall and other political halls of power. ... Items drew from background interviews with such sources as then-Mayor Tom McEnery, then-Congressman Norm Mineta, David Packard and political consultants like the late Gene Lokey. Abetted by a network of ghost writers and deep throats, the goal was to gather intelligence from knowledgeable sources, then tell it like it is, in a style that was patterned after the Kiplinger Letter, a Washington, D.C.-based financial newsletter. Hal Plotkin contributed items, and later Bob Hansen was recruited after he penned a letter suggesting that the column had lost some of its edge. Thinking it was a prank by another staff member (on slow weeks in Metro's early days, the staff had to make up letters to fill the page), Pulcrano asked to see the original, which featured at the bottom a crossed-out line: "P.S. How about a job?" "OK, wiseass," he retorted, "let's see what you can do." Over the next few years, Hansen took the column to a new level, turning up the humor, irony and meanness quotients. ... As the '90s rolled around, the column borrowed from Rob Schneider's "Making Copies" character on Saturday Night Live, appending "ster" to names or otherwise mangling monikers of the high and haughty to bring them down to earth a notch. Stylistically, the column was also influenced by Spy magazine's malicious "Usual Suspects" column. One of the first columns of its type in the alternative press, Public Eye was widely copied, both by weeklies around the country, for whom this type of column has now become a staple, and by the local daily, which named its entertainment section "Eye," the column's frequently used clipped self-reference. Metro sued the Mercury News and won a federal court ruling that established for the first time the trademarkability of a newspaper column name, but settled the action without payment of damages when the Merc agreed to relabel and end free distribution of the Friday tabloid. The Merc also shamelessly copied the column itself with a Sunday knockoff, "The Insider," which published from 1987 to 1999, when it was killed by Publisher Jay Harris, who told a Rotary Club audience, "I didn't like the column that much." When Harris fell on his sword over budget cuts, his successors revived the Public Eye knockoff as something called "Internal Affairs." ... In one of the column's finer coincidences, Knight-Ridder strongman Tony Ridder chose one of Eye's favorite restaurants to break the news of Harris' appointment to the Mercury's executive team on Dec. 7, 1994. As the execs guzzled expensive wine and scarfed down soufflé, Eye bribed waiters and parking attendants and waited in the dark to paparazzi the clueless newspapermen. Though blinded by our Polaroid's flash and liquored up, boss Ridder attempted to throw Eye off the trail by asking us, "Did you get a picture of our new publisher?" He then gestured to Polk Laffoon, who had taken cover in the back seat of a small Japanese luxury sedan, and ordered him out of the vehicle, instructing Laffoon to remove his overcoat for a photo op. With secondary confirmation from Merc editor Rob Elder, the Eye team filed the Laffoon-as-publisher item and hit the hay, only to awake with a funny feeling. Moments before presstime, the item had to be pulled and rewritten after learning that the American press lord had fed us a bald-faced whopper. ... Never one to rush to vengeance, Eye retaliated a few years later by treating its readers to details about Ridder's newly purchased wide-body Challenger 604 jet, a type favored by heads of state, at the same time his company was belt tightening with layoffs and employee buyouts. Another fine moment in political mendacity was exposed in 1990 when Eye called the University of San Francisco to check on downtown district council candidate Pete Carrillo's résumé, which listed a B.A. degree in public administration from that fine institution. Actually, his only sheepskin was an A.A. degree from Mission College. That election-eve bombshell tipped the race in favor of David Pandori. (Luckily, we only print the truth, not take responsibility for the outcomes.) ... OK, well, we did make up some facts, but that was on April 1. 1993, when we claimed that while "visiting Rio de Janeiro ... to establish yet another sister city for San Jose" in the midst of a budget crisis, Mayor Susan Hammer was spotted "lambada-ing the tropical night away at taxpayers' expense" in a "Dole banana G-string and red-flame grape pasties." Hammer went on camera and angrily told a TV interviewer that she didn't think the April Fool's prank was "very funny," and Councilmember Blanca Alvarado left a furious message on our voicemail. Reporters live for moments like that. ... The closest we came to telling an actual fib on a day other than the first day of April was when Tom McEnery refused to take our calls to confirm or deny loose talk that he was lobbying the soon-to-be-inaugurated Clinton administration for the ambassadorship to Ireland. So we had one of our Little Rock, Ark., operatives place the call, and thinking it was his wake-up call, the Tomster called back 11 minutes later. While not actually identifying ourselves as a member of the Clinton transition team, we did say we were calling "to gauge [McEnery's] interest in a position within the Clinton administration." Our correspondent had a hard time getting him off the phone as he spent 16 minutes summarizing his many accomplishments as San Jose's greatest mayor and ticked off various White House appointments that would complement his skill set. ... Over the years, Eye operatives managed to crash a good number of exclusive events in its mission to gain intelligence and defrock the pompous, even if it meant rubbing shoulders with U.S. presidents or occasionally getting pulled aside by the Secret Service. Eye wangled its way into private Clinton-Gore events in Sunnyvale and at the home of real estate baron George Marcus and, more recently, hondled front-section seats at Arnold Schwarzenegger's inauguration. The most brazen gate-crashing occurred in 1993 when Hansen grew tired of standing in the press area during a presidential speech and, spotting an empty seat in the front row of the VIP reviewing stand, planted himself next to the U.S. secretary of labor and various other elected and appointed officials. Amazingly, no one evicted him, though President Clinton kept casting puzzled glances at the slouching, disheveled guy in wrap-around shades and T-shirt amid the sea of dark suits. ... Sometimes we got busted. Eye was thrown out on its ear after sitting through an ineffectively guarded secret city-employee meeting ("That's Why I Get the Big Bucks," Feb. 6). City Manager Del Borgsdorf held the powwow to placate employees disgruntled over the prospect that Delbert gets to keep his six-figure salary while lowly city wage slaves suffer the specter of cutbacks and layoffs in uncertain economic times. City Spokescop Tom Manheim showed Eye the door as soon as the hum of angry workers subsided. There's never a good time to sneak out of a party, so Eye chose to end its life at the zenith of its political power and influence. "I hear Arnold reads it every Thursday morning," says Greg Larson, chief staffer for State Controller Steve Westly and San Jose's first budget boss. ... "Public Eye mattered because it said 'f--- you' to all the self-important a--holes in San Jose," reveals former Eye mastermind Will Harper. "And even though all the self-important a--holes thought they were above reading my column, they read it anyway to make sure they weren't in it." ... So, as this column swallows hemlock in a very public fashion and mangles the English language for the final time in this self-congratulatory biopsy, we know well that certain Eye subjects might not miss the persistent snooping and Vaseline-fingered probing. For instance, a vote-swapping city council member seeking support from a rival's endorsement list ("Fair Trade?" Dec. 25), or school district officials who apparently have no patience for public spending regulations ("Seeing Red," July 17). To those folks, the ones happy to drain their lizards on Eye's grave, we say, touché. To everyone else, so long. Last Eye Booboo Ever: Last week, due to a speed-reading injury, Eye misspelled the name of incoming Milpitas Planning Commissioner Zeya Mohsin ("Fair Trade?" Dec. 25). It won't happen again.